If you’re looking for an alternative to Apple’s AirPods, you’re in luck. 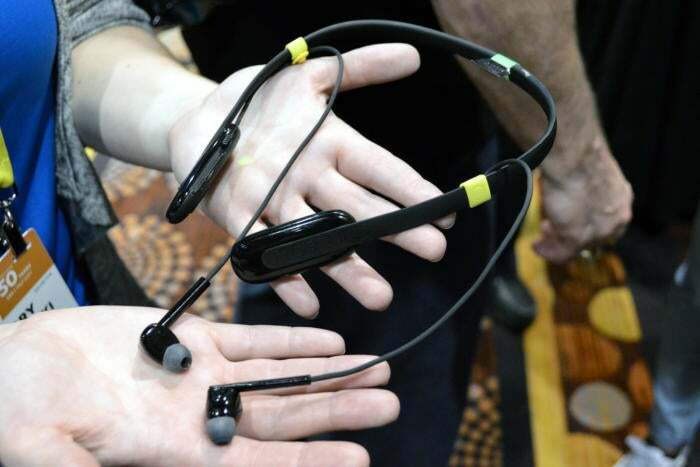 This year’s show floor is packed with “truly wireless” earbuds. Earbuds may never give you the rich, immersive audio-gasmic experience that a nice pair of open-back, over-ear headphones can offer—but so what? You don’t use earbuds to get lost in the nuances of music. You use them because they’re small, durable, convenient, and because over-ear headphones get super-sweaty if you try to wear them while you’re working out. But earbuds—especially wireless and “truly wireless” earbuds (thanks a lot, Apple AirPods)—are trickier than headphones, because something that goes inside your ear isn’t as universal, fit-wise, as something that covers your ear. So it’s no surprise that CES 2017 is awash with earbuds in all sizes and shapes, and with and without wires. 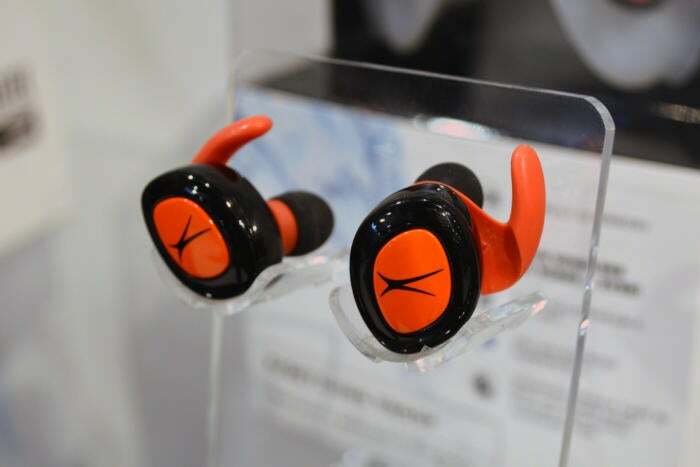 Take a look at the coolest earbuds we saw on this year’s show floor. Alpha’s Skybuds are a pair of slick-looking truly wireless earbuds that will appeal to people who don’t fit into Apple’s one-size-fits-all AirPods, because they come with three tip sizes: small, medium, and large. These water-resistant, sweat-proof earbuds offer four hours of uninterrupted listening time and come with a recharging “Skydock” case that holds 24 hours of extra charge time. The Skybuds come in three colors—charcoal, “nimbus” (silver), and pearl—and are available now, online and in Best Buy stores, for $220. If you’re looking for true freedom with your truly wireless earbuds, you’ll want to check out Altec Lansing’s Freedom 2 Wireless earbuds. They aren’t just water-resistant, they’re waterproof—as in IPx7-certified, which means they can be immersed in up to 1 meter of water and still keep pumping. The Freedom 2 Wireless earbuds are 40 percent smaller than the original Freedom True Wireless earbuds, and feature class-one Bluetooth with a range of 100 feet and five hours of continuous battery life (plus an additional 10 hours, or two charges, in the included recharging case). They’ll start shipping sometime in Q2 2017 for $150. 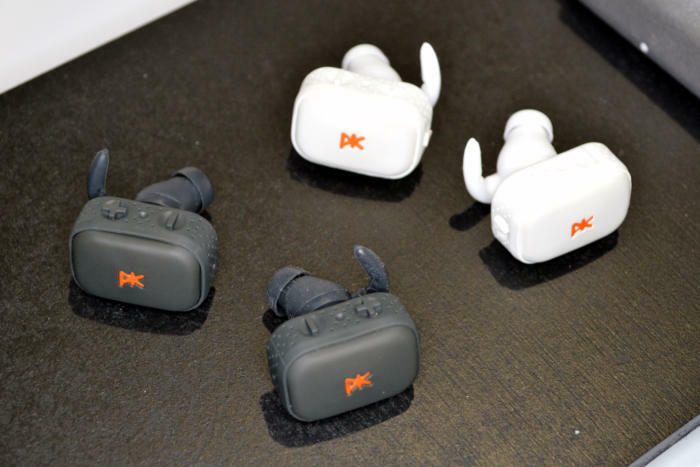 PKparis’ K’asq Sport earbuds, modeled after the company’s recently launched K’asq earbuds, are just $100, which makes them some of the most affordable truly wireless earbuds we’ve seen so far. The K’asq Sport earbuds offer five hours of continuous playback (plus an additional 15 hours, or three charges, in the included recharging case) and physical volume and play/pause control buttons on each bud. These earbuds are also IP55-certified water-resistant, which means they’ll make it through intense workouts and rainstorms, but you shouldn’t take them swimming. The K’asq Sport earbuds will start shipping early this year, Q1 2017. 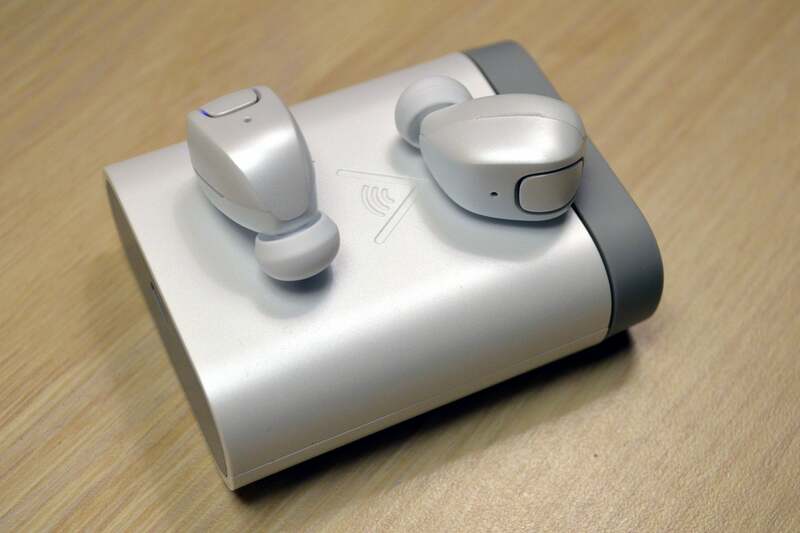 If earbuds just don’t seem to fit your ears for whatever reason, you might want to check out Dog & Bone’s Earmade wireless earbuds. These wireless (but not “truly wireless”) Bluetooth earbuds come with two sets of custom moldable inserts and a special heating dock that you can use to make perfectly fitted earbuds. The process is super easy and takes about two minutes: Just heat up the moldable inserts and then smoosh them into your ears. After they’ve been fitted, you can attach them to the included earbuds, which are sweatproof, water-resistant, and offer six hours of continuous playback time. 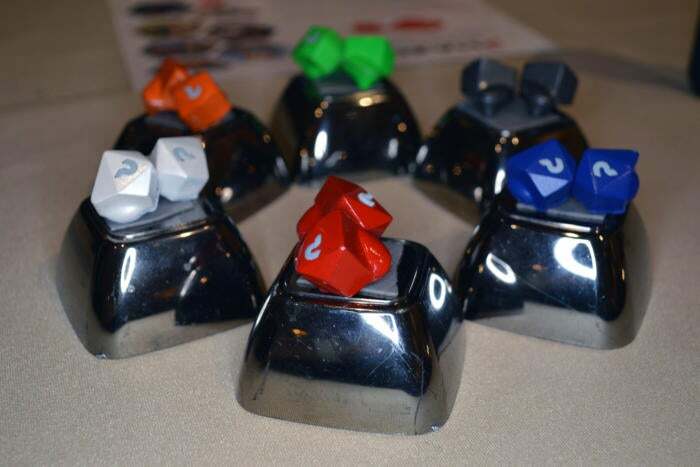 The inserts can be re-molded at any time with the heating dock (and you get two pairs of inserts, just in case). The Earmade earbuds will be available sometime this year and will cost $160. JAM’s Transit Ultra earbuds are another pair of truly wireless earbuds worth checking out. These textured earbuds have a similar shape to the Skybuds, which means they tuck neatly in your ear and come with multiple tip sizes for a semi-custom fit. The Transit Ultra earbuds offer three hours of playback and come with a matching recharging case that packs an additional 18 hours (or six full charges) of battery life. 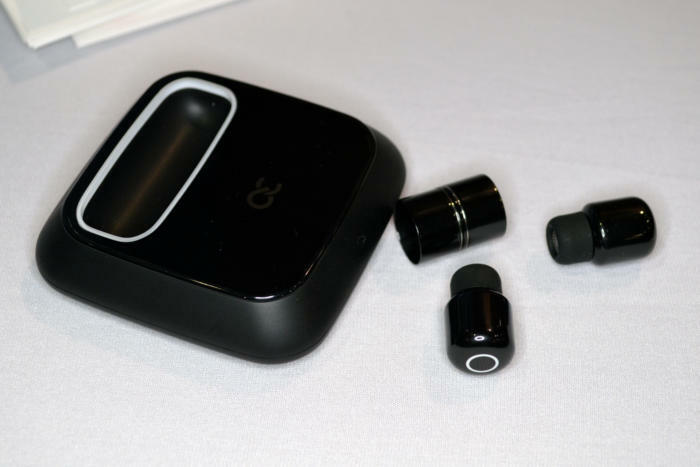 These earbuds will cost $120 and start shipping this spring. If you don’t think you can get audiophile-quality sound in a tiny earbud, think again: 1More’s new Quad Driver In-Ear headphones feature four separate drivers (one carbon dynamic driver and three armatures dedicated to different frequencies) for impressive sound quality. 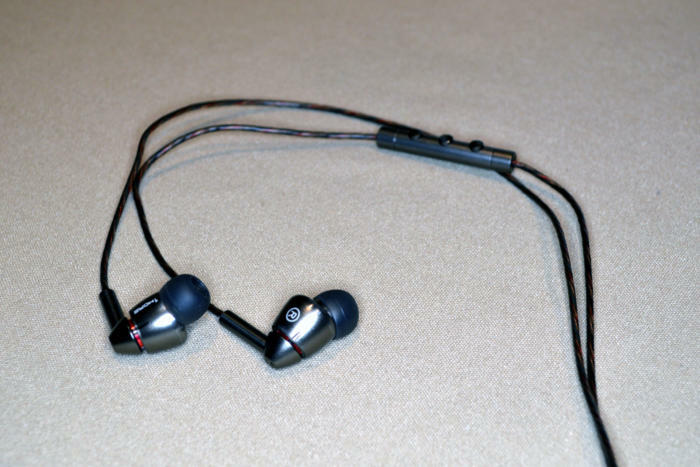 Most earbuds have a dual-driver construction (bass and mid/high), so the difference here is audible. 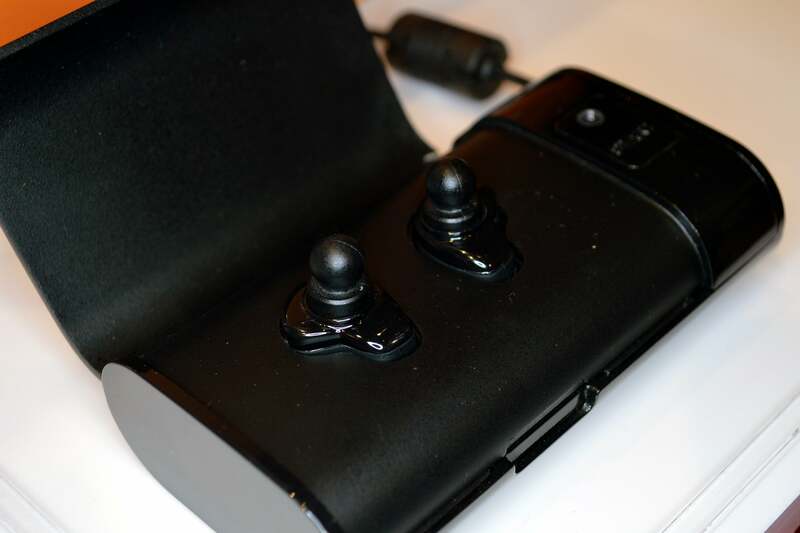 The earbuds have an inline microphone and physical control buttons and come with five sets of silicone tips and three sets of foam tips for the perfect fit. The Quad Driver In-Ear earbuds are wired (sorry, iPhone 7 users), but they’re some of the most premium-feeling headphones I’ve ever handled—you won’t regret spending $199 on these when they hit shelves in February. Sennheiser’s Ambeo Smart Surround earbuds are unique: These white, wired, in-ear headphones are designed for both listening to and capturing audio—specifically, binaural audio. Binaural audio is basically the three-dimensional audio you hear in the real world (if something explodes to your left, for example, the sound will be louder in your left ear). 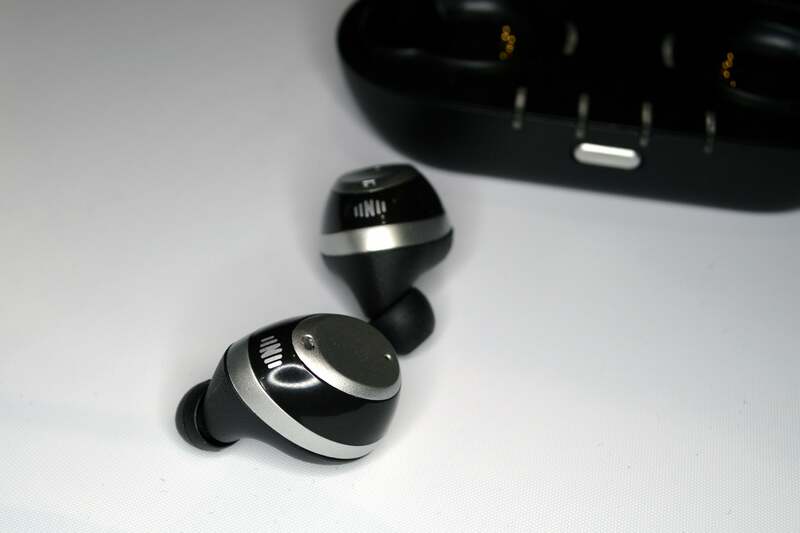 Each Ambeo earbud has a built-in microphone that lets you easily record this 3D audio on your phone, and the sound files can then be played back through an app (using any headphones, including the Ambeos). We’re not sure how much they’ll cost yet, but the Ambeo Smart Surround earbuds will be available in the second half of 2017. House of Marley’s Smile Jamaica BT earbuds are eco- and cost-friendly—these in-ear headphones cost just $60. Like all HoM products, the Smile Jamaica BT earbuds are made of sustainable materials: FSC-certified wood, recyclable aluminum, and the company’s trademarked, eco-friendly Regrind silicone. 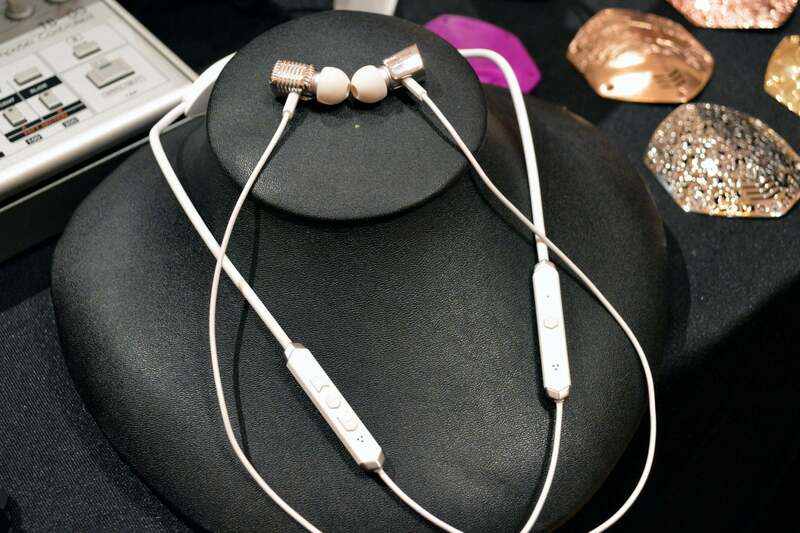 These earbuds are wireless but not truly wireless—the buds are connected to each other through a short braided cable embedded in a neckband. The Smile Jamaica BT earbuds offer eight hours of playback, come in three colors (black, copper, and denim/brass), and are available now. 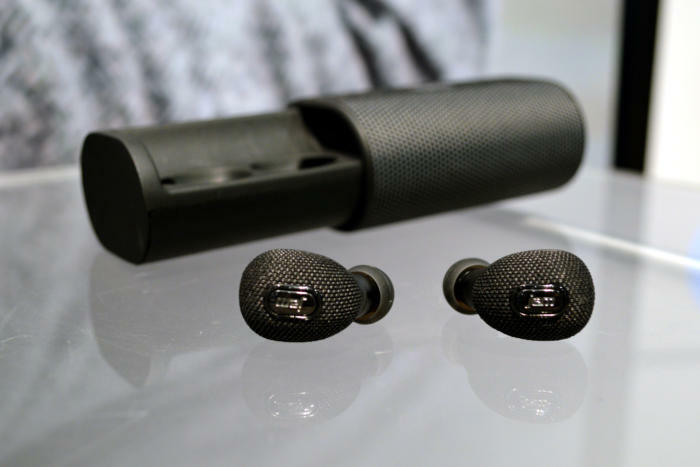 Phazon’s new truly wireless earbuds are ridiculously rugged. These earbuds are IP68-certified, which means they’re dust-proof and waterproof, immersible in up to 10 feet of water, and of course sweatproof and shockproof. The Phazons are designed with athletes—including swimmers—in mind, and their unique shape is part of what the company calls “neverfall” technology (as in, they’ll “never fall out”). I didn’t have a chance to take them on a workout, but the prototype did fit snugly in my ear canal. The earbuds offer six hours of battery life, which is very good for a truly wireless bud, and come with a recharging case that will give you an additional three charges, or 24 hours total. 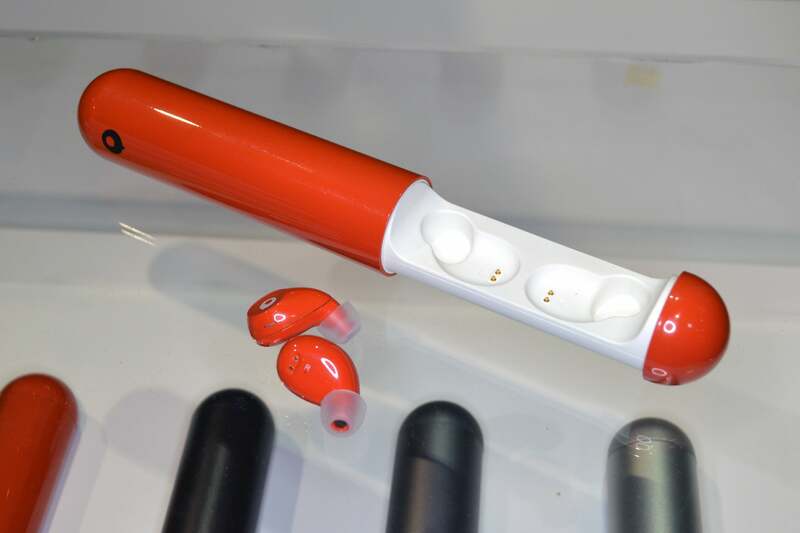 These earbuds, which will come in a variety of colors including red, purple, blue, and orange, will start shipping in February for $199. V-Moda’s headphones are all about design, and the V-Moda Forza Metallo Wireless earbuds are no exception. Like many of the wireless (but not truly wireless) earbuds we’ve seen, the Forza Metallo Wireless earbuds have a lightweight neckband to keep the buds in place when not in use. Unlike most of the other neckband-style wireless earbuds we’ve seen, this neckband has a “trap lock system,” which basically just means that it features custom-formed aluminum that “locks” onto your trapezius muscles so that the neckband doesn’t slip off your neck. The earbuds themselves are small and look almost like jewelry, and V-Moda also sells 3D-printed metallic caps for a custom twist. The Forza Metallo Wireless earbuds will be available in the the first quarter of this year, and will retail for $170. Most of the truly wireless earbuds we’ve seen are pretty bulky, which is understandable (especially if you’re looking for longer battery life) but frustrating if you have small ears —like me. 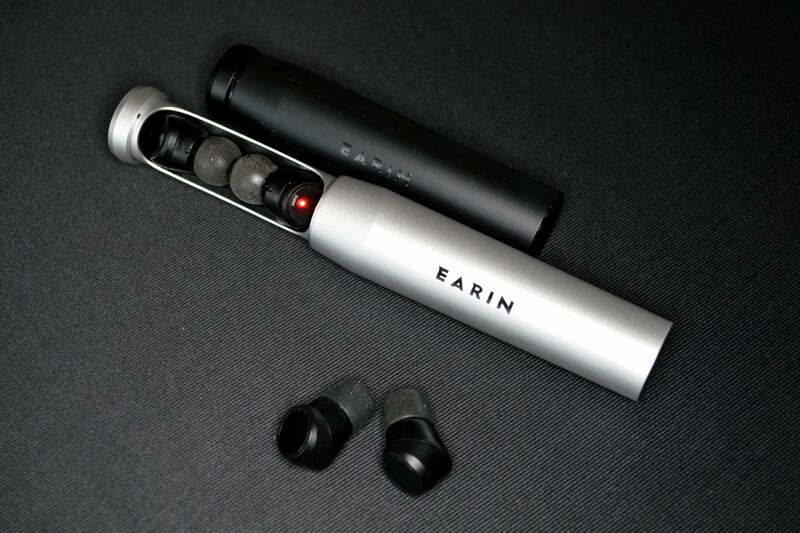 Earin’s new M–2 earbuds are the first pair of truly wireless earbuds I’ve seen that are genuinely unobtrusive: These tiny, lightweight earbuds weigh just 3.6 grams and sit almost completely inside your ear canal. The M–2s are Earin’s second pair of truly wireless earbuds, and these new buds address some of the issues Earin had with its first model—specifically, “drop-off” between the two buds (the M–2s connect to each other using Near Field Magnetic Induction instead of Bluetooth). The M–2s have dual microphones in each bud, touch controls, and three hours of battery life plus an additional three charges in the charging case for 12 hours total. You’ll be able to get your hands on these earbuds in black or silver in Q2 2017 for $249. 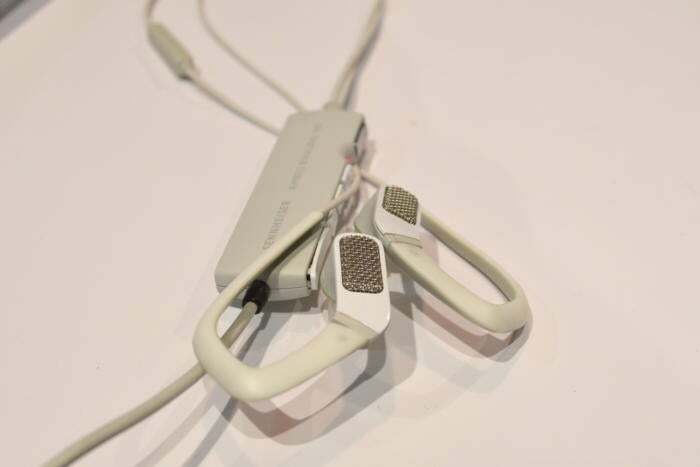 The Orosound Tilde headphones aren’t truly wireless—each earbud is connected to the other via a flexible neckband—but they do have a few tricks up their sleeves. These Kickstarter-backed earbuds are designed for “well-being in the office,” according to the company. Let me explain: The Tildes feature adjustable noise cancellation, which lets you determine how much background noise is (or isn’t) filtered through, as well as a special “talk-in-noise” mode that lets you hear only the person you’re talking to. 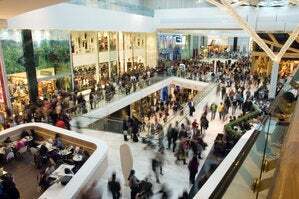 The talk-in-noise mode filters out ambient noise (including human voices) around you and filters in voices coming from in front of you (within a 60-degree “cone”), so you can easily talk to someone face-to-face in a crowded setting. If you use the Tilde earbuds for listening to music or the “talk-in-noise” mode, you’ll get eight hours of battery life, while if you just use the earbuds for adjustable noise cancellation, you’ll get a whopping 20 hours. 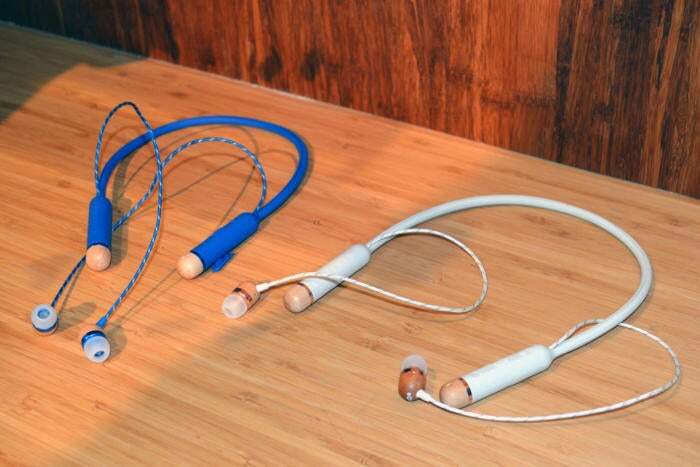 The Tilde earbuds will be available this summer for $300. You can probably tell from the name: Nuheara’s IQbuds are “smarter” than your typical truly wireless earbuds. These intelligent earbuds are similar to the Orosound Tilde earbuds—the IQbuds can be used for both assisted audio, including voice-boosting in loud environments, and regular audio like music and phone calls. Unlike the Tildes, the IQbuds are truly wireless and do not feature a 60-degree “cone” of voice-boosting; instead, the IQbuds feature “Super Intelligent Noise Cancellation” that lets you amplify voices all around you, which might be better for a party or social setting where you’re not looking directly at the person you’re talking to. The IQbuds offer four hours of battery life for regular listening and seven hours for assisted audio (voice-amplification and noise cancellation), and come with a recharging case that holds an additional three charges. The IQbuds are set to ship in March for $299. If Earin’s M–2 earbuds piqued your interest, Ashley Chloe’s Fuse earbuds might also look appealing: These truly wireless smart modular earbuds are about the same size as the M–2s and are housed in an ultra-stylish ceramic casing with a black mirror finish. But what’s really cool about the Fuse earbuds is the “modular” part. When the earbuds launch later this year, the company will also release a variety of charging options, including a fast-charging desktop dock, a charging bracelet, and a charging necklace/pendant. I’d hesitate to call these accessories super fashionable—the pendant isn’t exactly something I’d wear to complete an outfit—but they look chic enough for fashion-tech. The Fuse earbuds, which are available for preorder now, will start shipping in fall 2017 for $199—accessories sold separately. Crazybaby’s truly wireless Air earbuds have an ergonomic fit that “locks” into your ear (similar to the Skybuds) and come with adjustable silicone tips. Despite their larger size, these earbuds are very lightweight at just 4 grams each and offer impressively immersive sound thanks to a carbon nanotube diaphragm. The Air earbuds are IPX6-certified water-resistant, which means they should be fine in rainstorms or even showers, but not a pool. 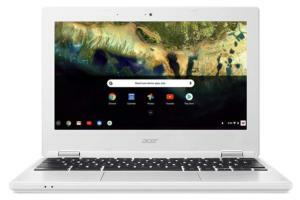 They sport dual omni-directional microphones, and offer three hours of battery life (plus an additional four charges in the included charging capsule—15 hours total). The Air earpods will start shipping (for non-Indiegogo-backers) in about three months, will cost $169, and will come in five colors: black, silver, gray, green, and orange.